Leach Pottery but whose personal seal? 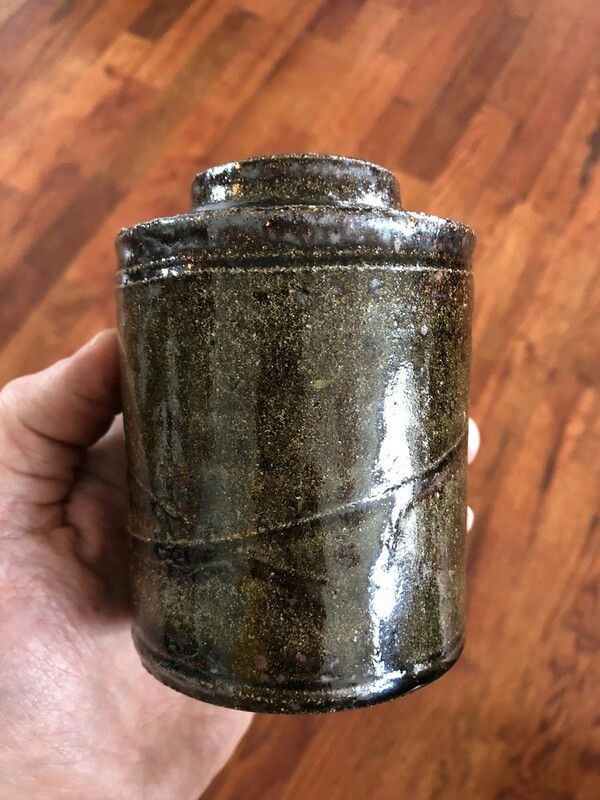 I took a few things to be sold at a local auction before Christmas and noticed the pot below in a rag bag of ceramic bits on a cabinet. I asked the auctioneer when they were going to be sold and he said that they were bits that had been left by the buyer and if there was anything that I fancied then I could take them. Most were bits of commercial pottery from the last 10 years or so but I did take this plus a small Chelsea Pottery pin dish. Now I know that it is the type of thing that you might post on here thinking I might know the individual potter, whose seal is next to the Leach Pottery seal, but I don't........................ so fire away!!!!! 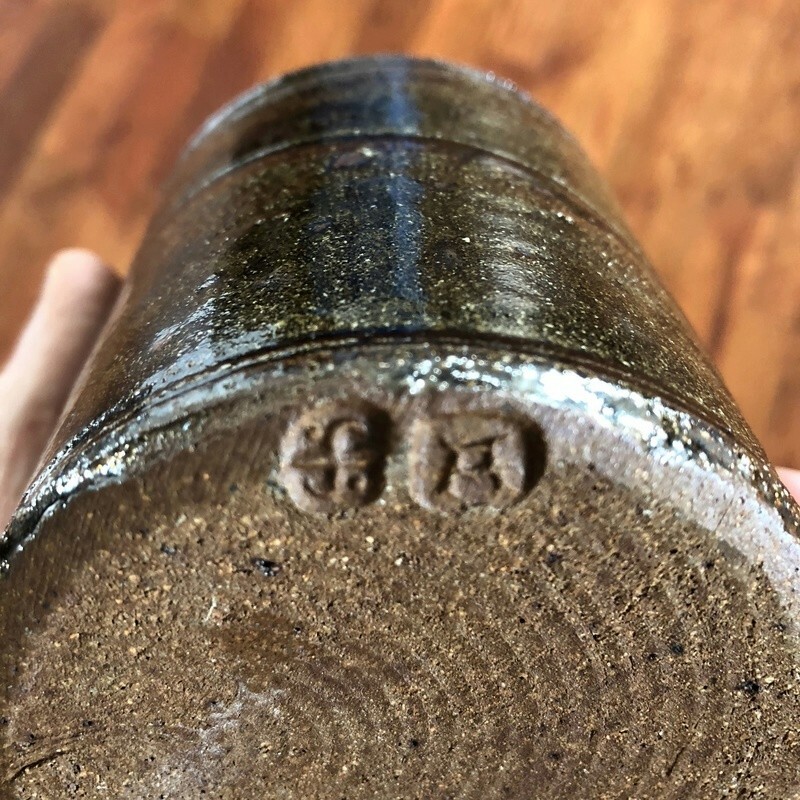 Re: Leach Pottery but whose personal seal? Looks like AM or MA. Could it be Alix MacKenzie? 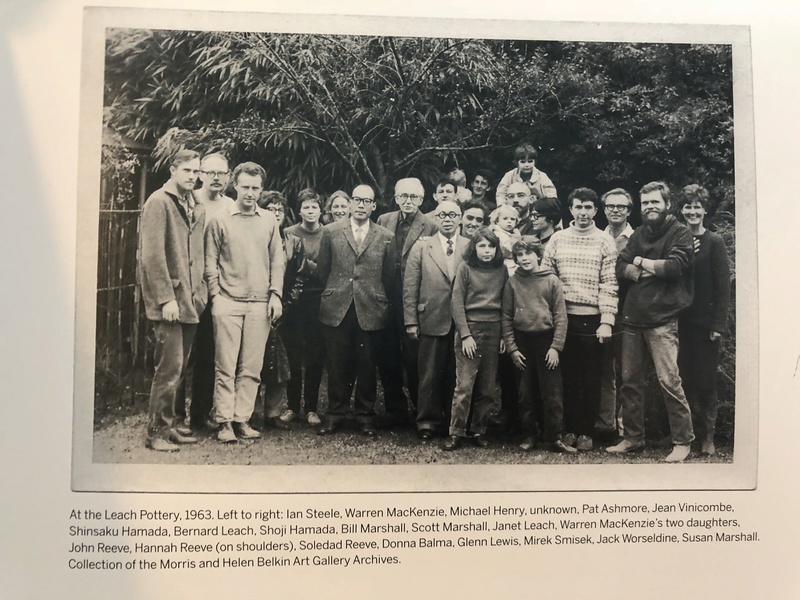 I know that it isn't Alix MacKenzie, as I have seen her mark on a St. Ives pot and I don't believe Alex McErlain worked there (I know he was at Winchcombe). 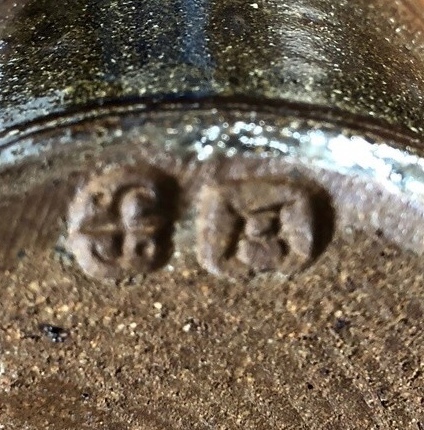 I can see similarities with the fancy bits on the end of the A with Alan Brough's mark there but the mark on my pot looks fairly clear and I can't see a B. I suspect that it is from the 1960s/70s though. Many thanks both of you and please feel free to keep making suggestions. I think Naomi's suggestion of Alix MacKenzie is quite possible (looking at the list of potters who worked there and dates). 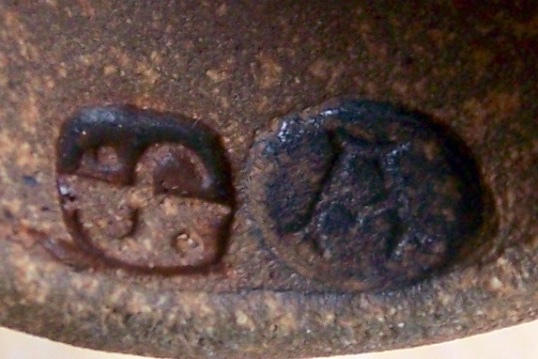 Again thinking along the lines of it being an AM monogram, they both worked there at around 1950 (I'm guessing this pot would be date around the 50's?). 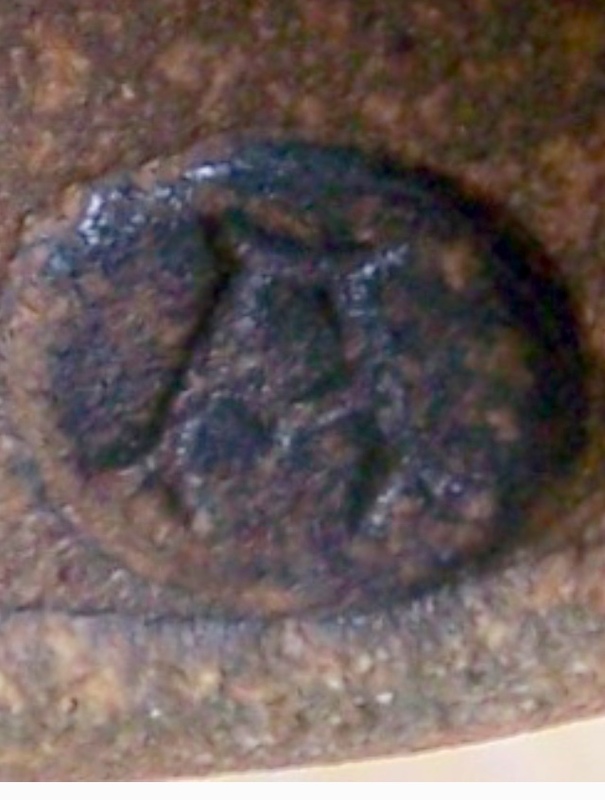 I have seen the M joined A mark on a Leach Pottery item, which in the Yates-Owen/Fournier book is under Warren Mac but I have always assumed this is incorrect and it is his wife's mark, as there is an WM mark there as well. I suppose that it could actually be correct and Alix used another mark and possibly this one. Hi, welcome to the forum, and thank you for your detailed input to the debate. I suspect they were both made within the past 20 years, by a visiting potter - and, with the latest evidence, it seems they were most likely Canadian. Unfortunately Leach Pottery doesn’t seem to keep very good (if any) records of visiting potters’ marks. Alix Mckenzie died in 1962. The Mackenzie's were at the Leach Pottery 1949-52. Now that was a time when the pottery was in full swing with a full compliment of the Leach family and Bill Marshall. Personal marking was very limited in that era. What is the likelihood that an apprentice or associate would have been even allowed a personal mark? What is the likelihood that an apprentice or associate would have been even allowed a personal mark? They are not in the Leach style, so I doubt they are by an apprentice. Although I don't have the pot at the beginning on this thread any more my best guess when I posted it and it still is my best guess is that it was made in the 1960s, maybe the 1970s but certainly no later. I believe that they were made at the Leach Pottery when potters working there, who had shown sufficient skill, were allowed to make the occasional individual piece after completing their other tasks. philpot wrote: Alix Mckenzie died in 1962. The Mackenzie's were at the Leach Pottery 1949-52. Now that was a time when the pottery was in full swing with a full compliment of the Leach family and Bill Marshall. Personal marking was very limited in that era. What is the likelihood that an apprentice or associate would have been even allowed a personal mark? Certainly from the late 1950s into the 1970s many were. 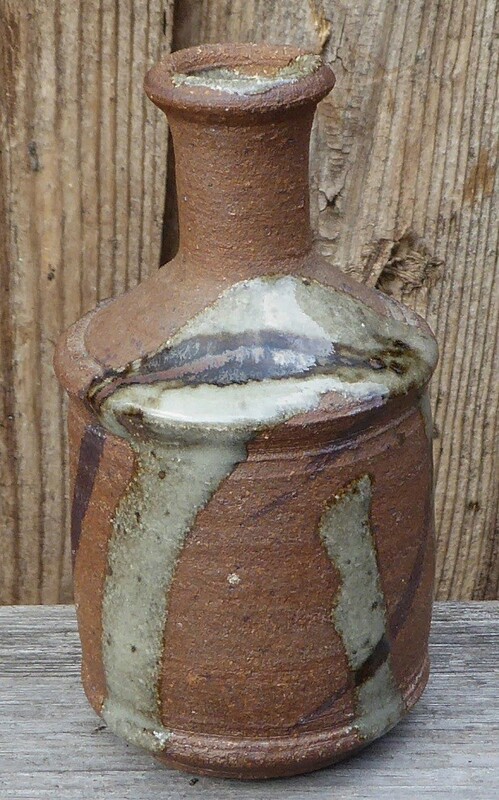 I’ve bought a number of pots from the Leach pottery and secondhand bearing both the potter and the pottery’s marks. What may have been true back in the 60s and 70s was flung to the side after the managers moved in. If you look on the website, it seems that their apprentices are actively encouraged to use a personal mark for marketing reasons. Really, if you cannot identify a personal Leach mark, the assumption must be that it is from the modern era. They seem to hand them out like Jelly Babies to all and sundry nowadays, and since it has been going for over a decade. a lot of potters have been making there. It is a badly ill judged policy. As custodians of an important historical heritage pottery they leave a lot to be desired. These days the people, who run the pottery on the site of the Leach Pottery, to my mind have no moral right to use the Leach Pottery St. Ives seal on any of the pots produced there. It is done to make these pots saleable when the work might not be and you are quite right that these days anyone can and is encouraged to put a personal seal on their pots for the same reasons. However, that is not really relevant as the two pots here are, as far as I am concerned, are from the days when Bernard was still alive and Janet was running things at the pottery. 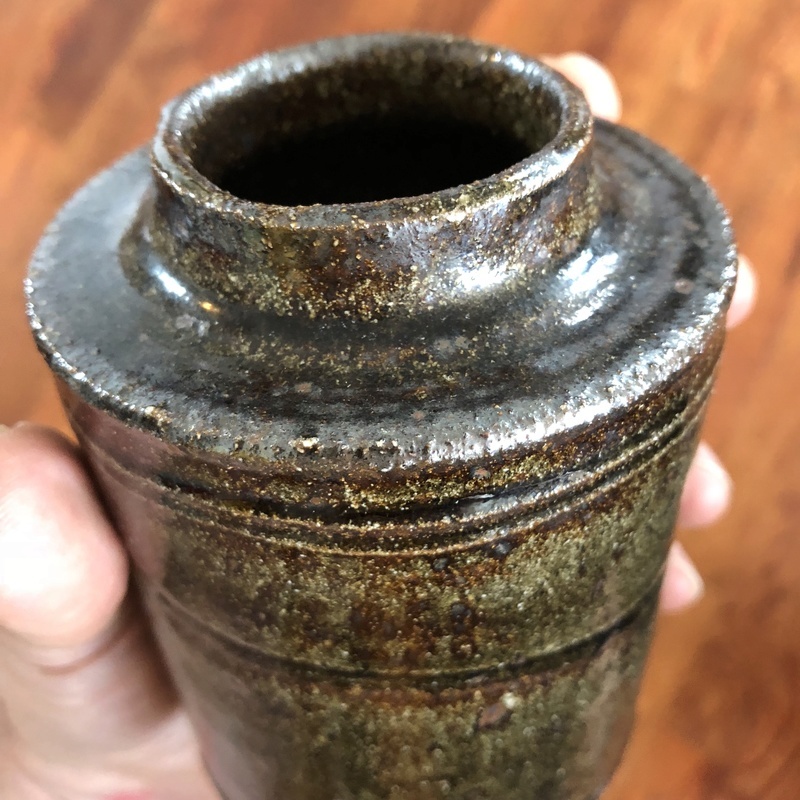 Having held and seen one of these pots in "real life" the stoneware body just told me that it was around 50 years old and the fact that the other pot in this thread comes from a collection with potters active in England at that time to me adds weight to my original opinion. The Canadian Leach apprentices were there mostly in the early to mid 60's. They were John Reeve Michael Henry, Glenn Lewis and Ian Steele. Later (in the 70's) Charmain Johnson and Martin Peters both spent time at the leach pottery. I forgot that I had this. It is small, being 10.8 cm (4.25 inches) tall and I bought it at a Boot Fair on 28th April 1996 for 50p.